UPDATE: this post is being translated to German. Link will be provided once translation is ready. WHO EMF Project, under the ICNIRP’s “supervision”, is preparing the Environmental Health Criteria for radio-frequency modulated electromagnetic fields (EHC RF-EMF). This document will evaluate all possible health risks from the radio-frequency modulated electromagnetic fields (RF-EMF) emitted by the wireless communication devices. The EHC RF-EMF is delayed for some 10 years now. As I wrote on BRHP, partial draft of the EHC RF-EMF document, written by the group of scientists with a dominating presence of ICNIRP members, was released for the general public comments in 2014. The next steps were to update the text using comments received, to select group of experts that will review the EHC draft document and to prepare the final version of EHC. Now, in the end of February 2017, the progress seems to be slow and no end in sight. The fate of the submitted comments is unknown because the consideration is at the discretion of the WHO EMF Project and its ICNIRP experts. The authors of the comments do not receive feedback. The expert group is still being selected, as I was informed by the WHO EMF Project head, Dr. Emilie van Deventer and, obviously, no time is yet set for the meeting of the expert group to prepare the final version of the EHC RF-EMF. In my BRHP blog posts I was very critical about the handling of the EHC RF-EMF by the WHO EMF Project and ICNIRP. The major problem is the process of the selection of experts that wrote the EHC draft text and the selection of the experts who will prepare the final document of the EHC. WHO EMF Project, by itself, has no expertise whatsoever to evaluate biological and health effects of RF-EMF. In everything that WHO EMF Project does the dominating role plays ICNIRP. In fact, it looks that the whole WHO EMF Project is a “front” organization for implementing of the opinions of ICNIRP members. ICNIRP is a “private club”-like organization where current members select new members, based on their standing in the research arena and on their opinions on biological and health effects of EMF. This “self-selection” process led to a very “unhealthy” situation where all ICNIRP members have the same scientific opinion on the biological and health effects of EMF. This is a clear-cut conflict-of-interest situation when the members of ICNIRP, while evaluating scientific evidence, may give preferential “treatment” to their own scientific opinions. When there is nobody to contest these opinions with alternative explanations, because all ICNIRP members have similar opinions, the final opinion will be skewed and is likely to be scientifically biased. The only way to avoid this conflict-of-interest, caused by the pre-existing scientific opinions of the ICNIRP members, is to diversify the group of experts that will prepare the final document of the EHC RF-EMF. There is a precedent that should be followed – in 2011 IARC expert group consisted of scientists with diverse opinions. This facilitated an open and in depth scientific debate. Such debates are impossible within the ICNIRP or its front organization, the WHO EMF Project, where all experts have the same opinion. The issue of the diversification of the composition of the expert group is strengthened by the existing lack of scientific consensus. As it was admitted by Dr. van Deventer in her interview with ‘The Daily Princetonian’ published on March 31, 2015: “The data is gray. It’s not black and white”… “There is no consensus, it’s true. There’s a big group and a little group, but it’s still two groups.” It is unclear where from Dr. van Deventer got the size of the groups (big and little) because no statistics exist in this matter. However, there is an even more significant opinion, that justifies the notion of selecting experts with diverse opinions to prepare EHC and not only those with one-sided opinion, as ICNIRP members are. Dr. van Deventer said according to ‘The Daily Princetonian’: “Although the [WHO EMF] project has repeatedly concluded that wireless network routers and base stations have no measurable health effects, the volume of information on both sides of the argument has maintained the debate this long, van Deventer said.” [text underlined by DL]. Group of experts with one-sided opinions, like ICNIRP, is unsuited for evaluation of “the volume of information on both sides of the argument” in an unbiased way. The conflict-of-interest due to pre-existing scientific opinions will hamper it and the only way to resolve this problem is to include experts with diverse opinions. The issue of the composition of the expert group that will prepare the final EHC RF-EMF is of paramount importance. This document will define what will happen with the wireless communications in the future and whether any health-related limitations will be, or will not be, imposed on the manufacturing industry and service providers. However, how outdated and obsolete the EHC RF-EMF document will be when it will be published in 2018 or 2019? So, in a few years’ time the 4G will become obsolete and the EHC RF-EMF document too? 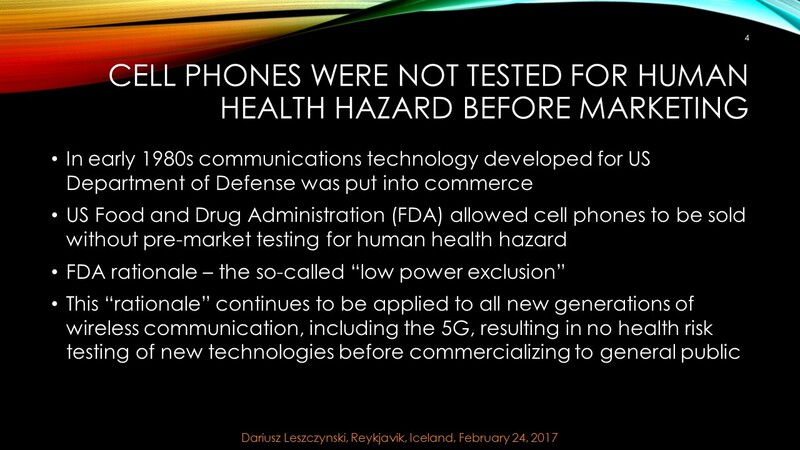 When the EHC RF-EMF will be published in 2018/2019, dealing mostly with the 3G and the 4G technology, the new 5G technology with completely different radiation exposures, incomparable in any way with 3G and 4G, will begin to be commercially implemented. Will the EHC RF-EMF be already on publication day obsolete? Finally, why any reference to 5G technology and its testing for biological and health effects is completely absent from the WHO EMF Project? How long we will be waiting for the EHC dealing with the 5G technology? This entry was posted in Mobile phones and health and tagged 3G, 4G, 5G, CoI, conflict of interest, EHC, Emilie van Deventer, Environmental Health Criteria, FDA, IARC, ICNIRP, ITPRO, low power exclusion, Mike Repacholi, Nicolas Fearn, obsolete, outdated, RF-EMF, single-sided, WHO, WHO EMF Project by dariuszleszczynski. Bookmark the permalink. “This document will evaluate all possible health risks…”. It will evaluate evidence against the ICNIRP *definition* of “established” effect. This means that every study must be *exactly* replicated in 2-3 other labs (exact replications almost never happen), a completely linear dose-reponse (as per thermal dogma) and every biological mechanism published in detail and acknowledged by (..drum roll..) ICNIRP. Full circle. And how does that fit with normal Public Health protection principles? If chemicals and foodstuffs were evaluated by same standard, none of them would – or even could – be regulated or banned. What’s so damn special about RF-EMF? I’d really love to see the reaction of ANY other Public Health protection body being told to use such absurd criteria for evaluating risk with ANY other agent of ubiquitous exposure. I’m sure they’d all resign in protest. Think about that while you drink a glass of tap water. I have ZERO confidence in Emilie van Deventer, the WHO EMF-project and ICNIRP. They should all resign, without protest.